WWF staff monitor logging operations in Gabon in Central Africa. Unsustainable use and undervalued natural resources cause the loss and fragmentation of the Congo Basin forest. 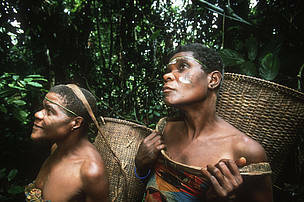 The Congo Basin forest ecosystem is hugely important to the economy of the region, and of the world. 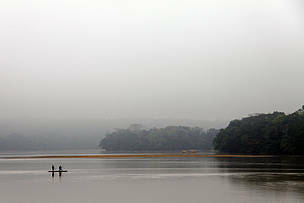 It provides food, fuel and shelter to millions of people, and regulates climate and rainfall far beyond their borders. 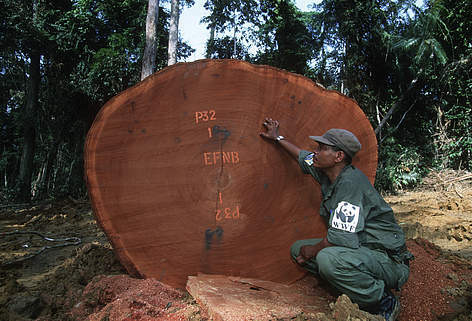 The timber industry, one of the top three employers in most of the Congo Basin’s countries, is worth several billions of Euros, and large reserves of oil and minerals as well as agroindustry could drive much-needed economic growth and development. But for exactly this reason, the forests are coming under intense pressure. Increasing local and global demand for food, wood, minerals, water and energy is fuelling unsustainable rates of resource extraction. The illegal trade in ivory and other wildlife parts is also taking its toll: over the last 10 years, the Congo Basin region lost an estimated 62% of its forest elephants. In summary, the biggest phenomena observed in the region is the shift of threats from inside of the forest to outside or external drivers, whose magnitude was very low previously, but is now rapidly increasing. WWF's Green Heart of Africa (GHoA) programme plays a dual role: addressing issues that cannot be dealt with at national level, and guiding, supporting and strengthening country office strategies and conservation work at national level. 2. Deforestation and forest degradation. 1. Raising the issue of the bushmeat and illicit wildlife trades on political agendas at local, national and international levels, and supporting governments to tighten and enforce legislation. 2. Support a network of protected areas which provides equitable benefits to all. 3. Working with communities and providing practical help to overcome poverty and to help them use forest resources in a sustainable way. 4. Working with companies and promoting sustainable forest exploitation through certification schemes such as the Forest Stewardship Council (FSC) and economic incentives like the Reducing Emissions from Deforestation and Forest Degradation (REDD+) scheme. 5. Advocating for minimising the impact of extractive industries, infrastructure projects and agri-businesses on key landscapes and species by promoting land use planning and resource governance. 6. Reducing local demand for wood fuel and charcoal by working with local communities and co-operatives to plant trees and produce fuel efficient stoves. WWF-GHoA is working closely with indigenous peoples and other local communities across Central Africa to help safeguard their traditions and their rights. These communities are also playing a crucial role in helping conserve the region’s forests and wildlife, contributing invaluable local knowledge. Their future is intimately linked to that of the forests, and they have a wealth of knowledge about the natural riches of the area. But many are struggling to meet their basic needs: poverty, disease and conflict are all too common. With the region's population expected to double to 150 million by 2050, tackling these issues becomes even more important. 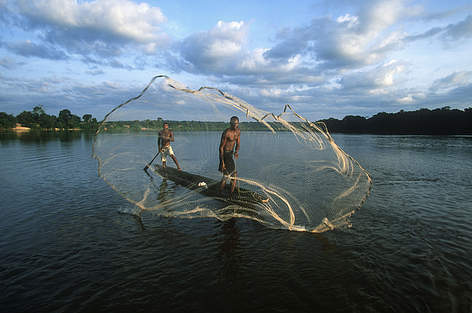 Forests have a major role to play in improving people’s livelihoods. By focusing on the protection and sustainable use of natural resources, WWF seeks to ensure that the Congo Basin’s forest and freshwater ecosystems will continue to provide for the region’s people, now and for future generations. 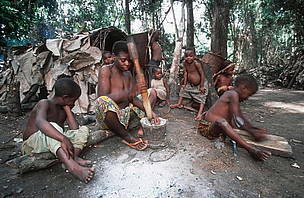 Pygmy of the BaAka tribe, family preparing food in a village.